It takes a lot of courage to try and change your life if you see no way out. 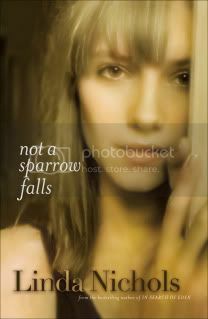 Not a Sparrow Falls by Linda Nichols focuses on Mary Bridget, who has made some bad choices and is living with the consequences. She believes that God does not see her. So many people think this at some time in their lives. Mary Bridget finds an opportunity to escape and begin a new life. But the past won't stay in the past. Will it change her new relationships? Is there such a thing as unconditional love? Can she be an instrument of healing someone else's life? There were a few places in the novel that I felt lost and couldn't place why a particular event or scene was included, but Nichols ties it all together in the end with a somewhat predictable and sweet ending. Definitely a book with themes of redemption, forgiveness and grace, both in the eyes of our Heavenly Father and fellow men. Linda Nichols is an award-winning and bestselling novelist with a unique gift for Touching readers' hearts with her stories. She and her family make their home in Tacoma, Washington. This book was provided by Bethany House publishers for review. No other compensation was provided.